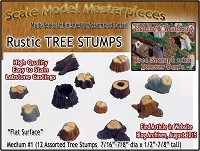 This product includes one (1) set of 29 Old Tree Stumps shown at right and does NOT include the scenery. These detailed, high-quality Labstone Old Tree Stumps are a natural light tan color and accept paints and stains very well. 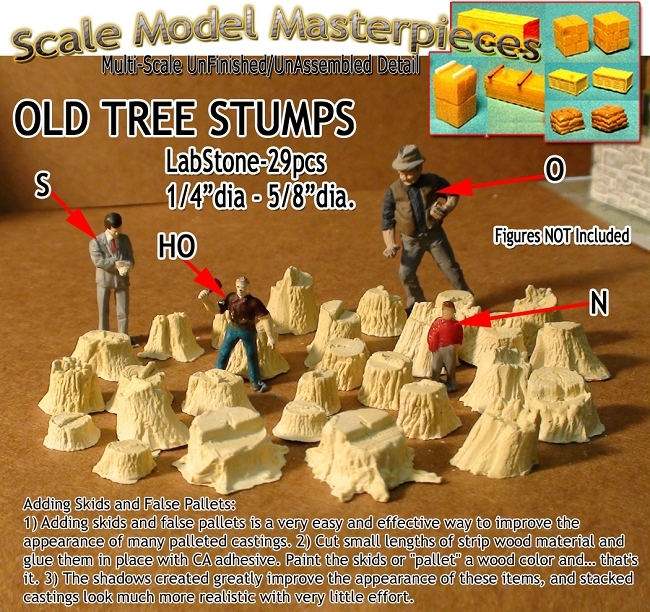 These Scale Model Masterpieces products are composed of UNFINISHED /UNASSEMBLED Natural Labstone casting parts-Assembly & Finish Required. Assembly using Doctor Ben's Hypo-Cement for tiny delicate parts as well as most plastic cements and painting may be completed by hand or an air brush. Want to know how to weather your finished model? Scroll down to find out how! The above image best describes this item assembled (required) & its design.